This subspecies has a pale green epidermis, angled tubercles and white stigma, whereas the similar T. polaskii has a brownish epidermis, flat, rounded tubercles and pink stigma. Habitat: Grows in heavy black earth among small green plants or grass and mostly under shrubs. 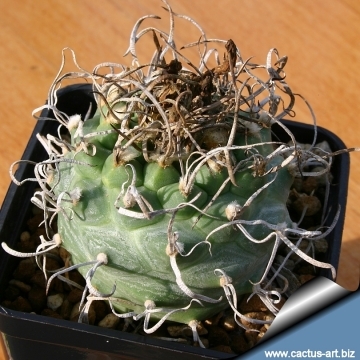 Description: Turbinicarpus schmiedickeanus subs. 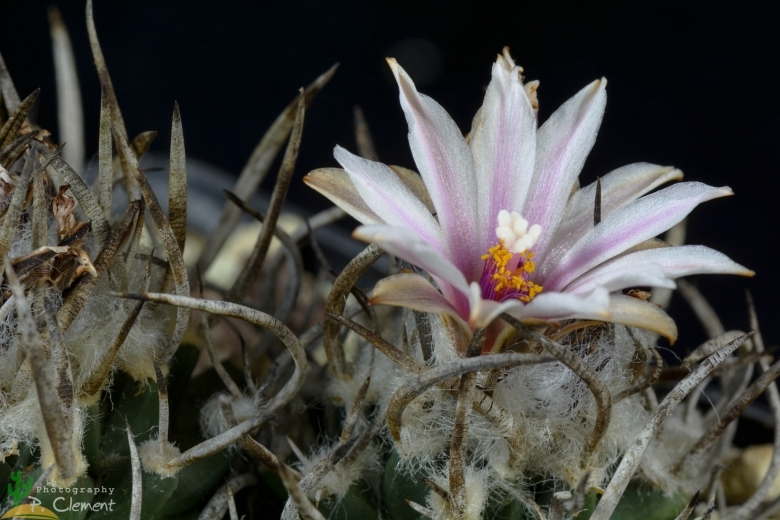 schwarzii best known as: Turbinicarpus schwarzii is a one of the several local form of the very variable Turbinicarpus schmiedickeanus distinguished for having flattened tubercles with yellow-grey central spines and ivory white flowers in spring. This subspecies exhibits wide diversity in form. 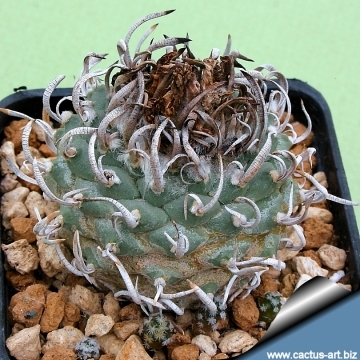 Habit: It is a solitary or slowly clumping, small cactus, dichotomy also observed. Stem: Flattened semi-globose, turbinate, pale green. In habitat rarely exceding 2 cm of height and 3,5-5 cm in diameter with a further 30 mm underground, but often much more larger in cultivation. Parastichy number: 5 and 8. Areoles: Oval, woolly, at top of plant, quickly disappear. Spines: 1 to 3 spongy yellow-grey, yellowish-brown or whitish horn coloured (Newly emerged centrals yellow-brown), the lower one longer, up to 2 cm, the 2 side spine approximately 4-5 mm, often missing, still shorter, flattened below, curved towards the apex and often contorted grey, corky, rather soft, with transverse fissures. 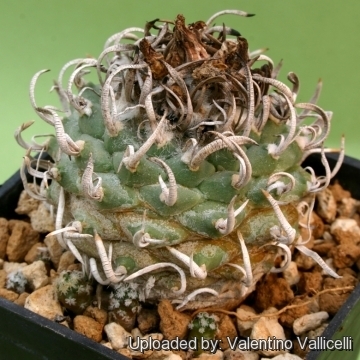 The spines are bunched at plant apex and persistent only on the upper body, below they fall off and the body and tubercles are corky and bare. Juvenile radial spines are feathery and very characteristic. 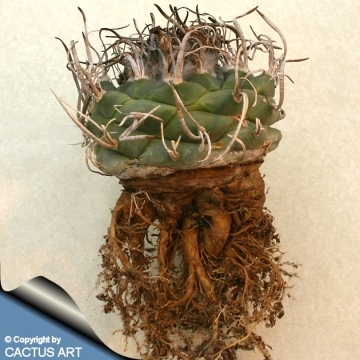 Root: Tap root, nearly shaped like a drawn molar tooth, with mass of fibrous roots. Flowers: Apical short tubed, campanulate, 20-30 mm long, 30-40 mm wide, sepals lanceolate, margins entire, white or (rarely) pink. Flowering season: Early spring (Jan-April) flowering. 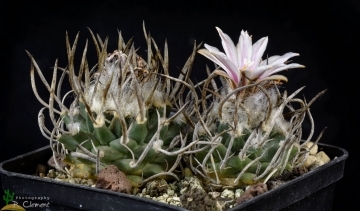 NOTE: For a long time it was thought that Turbinicarpus polaskii was a synonym of this taxa. 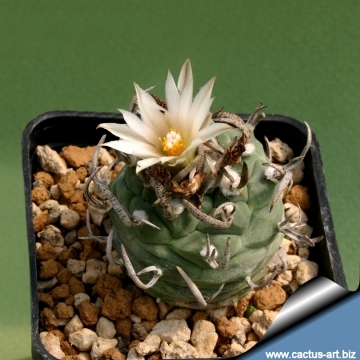 The easiest ways to distinguish between them are: schwarzii has a pale green epidermis, angled tubercles and white stigma, whereas polaskii has a brownish epidermis, flat, rounded tubercles and pink stigma.